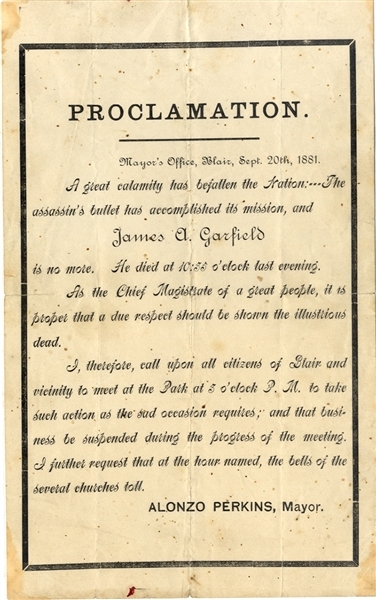 Lot Detail - The Mayor Announces the Death Of President Garfield. The Mayor Announces the Death Of President Garfield. Broadside, 5-1/4” x 8-1/2,” mourning ruled. In part, “PROCLAMATION, Mayor’s office, Blair, Sept. 20th, 1881, A great calamity has befallen the Nation --- The assassin’s bullet has accomplished its mission, and James A. Garfield is no more. He died at 10:00 o’clock last evening. ...I, therefore call upon all citizens of Blair ... to meet at the Park at 2 o’clock P.M. to take such actions as the sad occasion requires ...” VG.